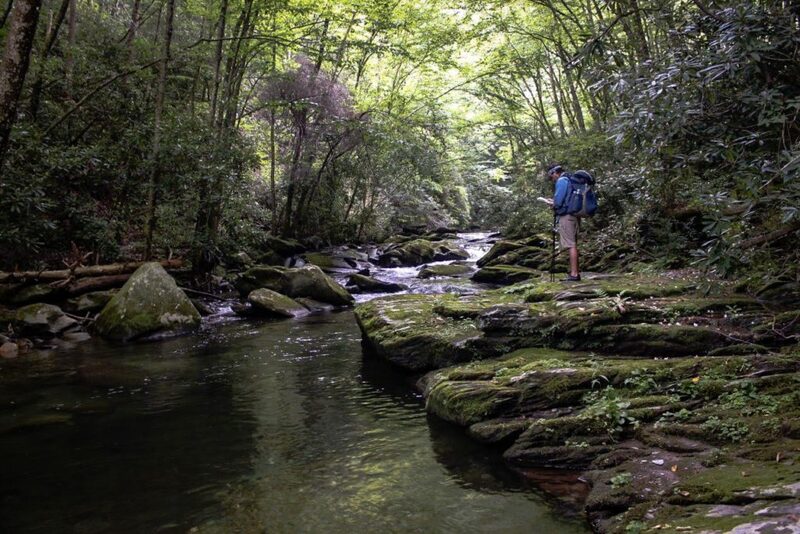 Roger Upton has hiked in every national park and national forest in the Southeast, and for the past several years, he’s shared his journeys as the Carolina Trekker. 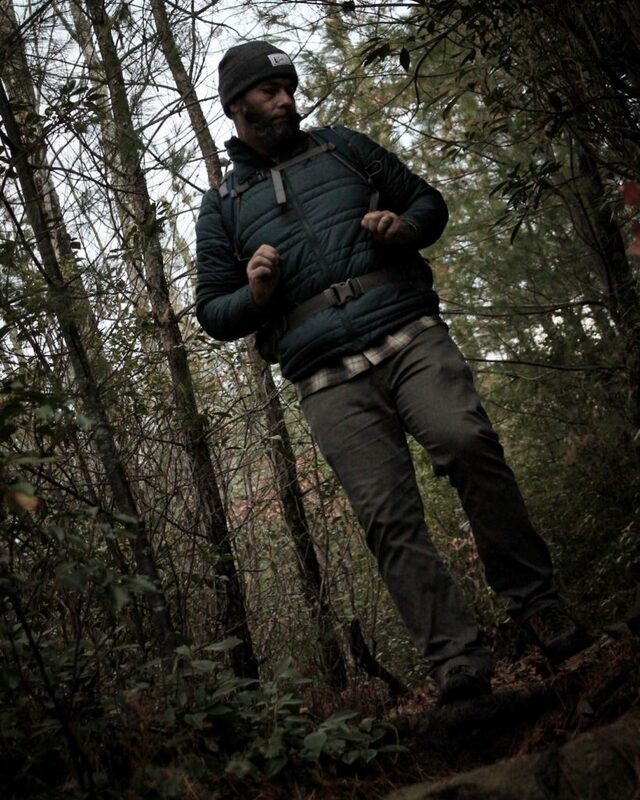 The South Carolina native explored the outdoors from an early age, and today, he continues to wander deep into the wilds of Appalachia. We asked Upton to offer his insights from his years of hiking in these hills. He’s also shared his five favorite photos and the stories behind them. This was a quiet moment in the Joyce Kilmer-Slickrock Wilderness as my hiking companion, Matthew, stopped to rest and double check his map. It’s always refreshing to hike with those who “get” you and whom you trust and respect out on the trail. This peaceful moment would soon be forgotten as we began the near-vertical push through thorns, blowdown, mud, and rocks to the Naked Ground terminus of Slickrock Creek Trail #42. 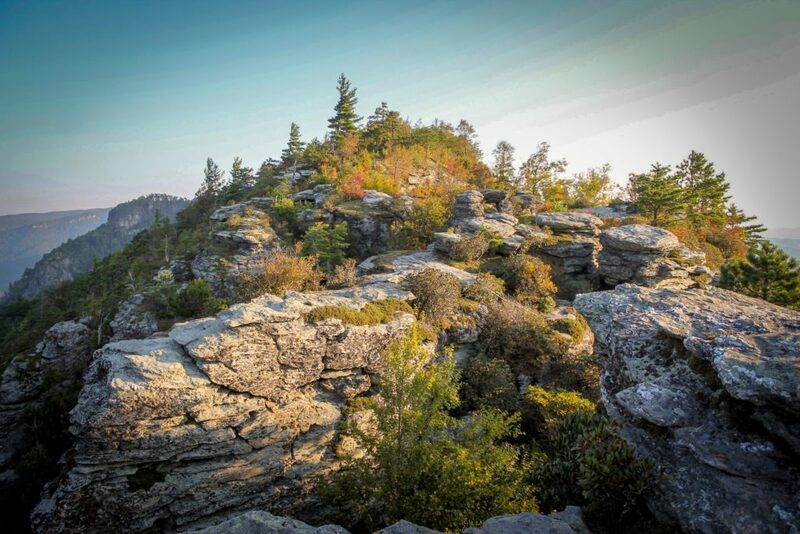 The ancient rock formations of Linville Gorge never cease to incite awe. This photogenic area along the Mountains To Sea Trail is known as The Chimneys. 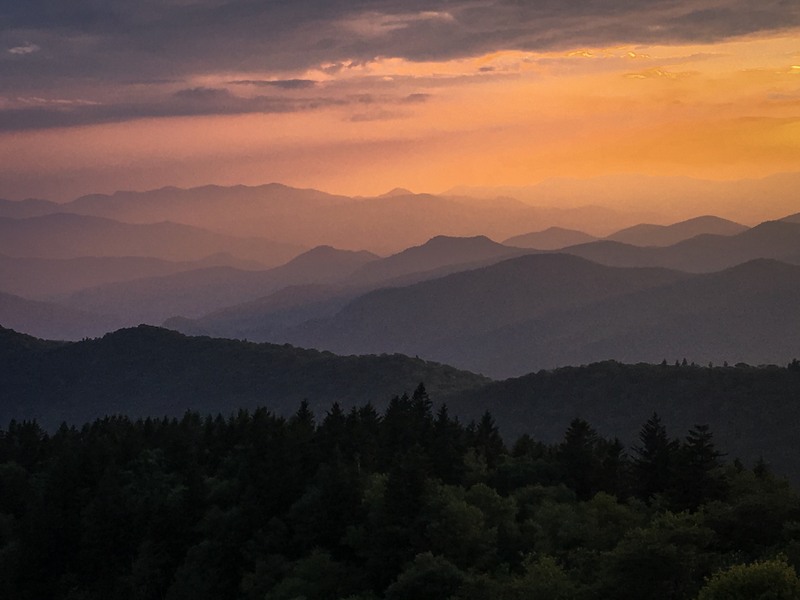 Catching sunsets along the Blue Ridge Parkway is one of my favorite things to do. Seeing how the dimming rays of the sun mixes with shadows to create explosions of color upon the layers of the Blue Ridge is awe-inspiring, if not breathtaking. 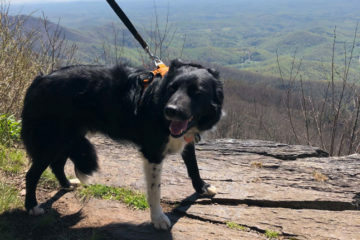 A perfect day to me is hiking somewhere off the Parkway, grabbing a pizza, and watching the light show at Cowee Mountain Overlook with faves. Heaven. 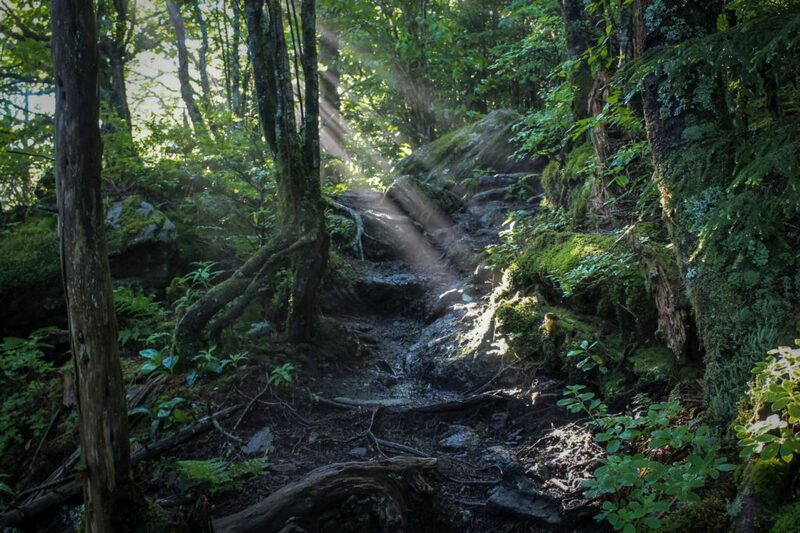 Sun rays cuts through the dissipating morning fog along the Black Mountain Crest Trail. The Crest Trail is my favorite hike in WNC. 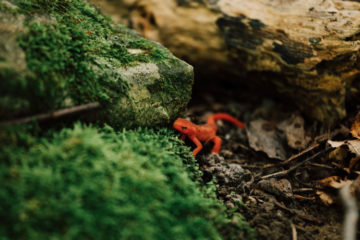 It’s the highest alpine trail on the east coast, boasting almost a dozen 6,000’ peaks along its 12-mile route — and while the hike is a challenge, the countless mountain vistas and moss-covered cloud forests are unparalleled. Anyone who knows me knows I am most at home among the mountains and streams and trees. Nature both rejuvenates and humbles me. It’s the one place where I feel truly connected to something far greater than myself. I am a guest of the wilderness, if not a welcomed outsider. For whatever hours and miles I hike, it’s here that I am truly free and without care. I might not be lost, but it’s here that I lose myself. BRO: What are your favorite places to hike? How far along are you on your South Beyond 6,000 attempt? The SB6K is a challenge of bagging 40 peaks in the Southern Appalachians that are at least 6,000’ in height. I like to climb, I like a challenge, and I like solitude. These peaks and their trails meet all those criteria for the most part. I’m about halfway through the challenge. What lessons or insights have you discovered on the trail? Be prepared. Nature provides, but nature can also be deadly. Respect it. I’ve found that nature is as spiritual as church, and climbing over rocks, up hills, and through thorns is as relaxing as any vacation. Everyone should try it. What have the toughest, scariest, or most memorable moments from the trail? All those can be answered in one hike: Slickrock Creek Trail in Joyce Kilmer-Slickrock Creek Wilderness, located in Nantahala National Forest. It’s revered in the hiking community as one of the ten or so toughest hikes in the country. Aside from the endless creek crossings, insane heat (we hiked it in mid-July), climbing over downed house-sized trees, keeping the faint trail among overgrown thorns, picking ticks and dodging snakes — the final straight up ascent is enough to break most hikers — if they even make it that far. I’ve never left a hike so bloodied, bruised, and battered physically and mentally. But was it worth it? Hell yeah! What advice to you have for others who may want to follow in your footsteps? Do your research. Respect nature. Care for it. Always bring extra socks. Photography isn’t something I know too much about—I’m a hiker with a camera—but I simply try to capture what I see and tell a story. I write as a means of decompression after a good hike, and as a means of conveying information that is hopefully educational and inspires you to get out there.